Toddlers are tricky little people. They can eat chicken 5 days in a row and then look at you like you’ve given them mud for dinner. 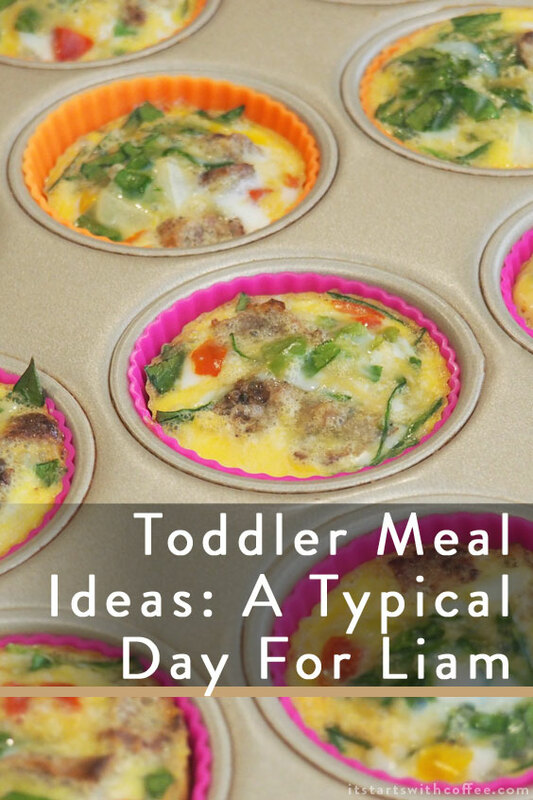 Now that Liam is nearly two I feel like we have a good idea of what he will for sure eat. We want to always get certain things into his meals: protein, carb, fruit, vegetable. But some days are easier than others. I am sharing some toddler meal ideas along with recipes and time savers that you will really find helpful or at least I hope! Option 1: Yogurt and fruit. Liam LOVES Greek yogurt and he loves berries so this is a no brainer. He loves feeding himself so it’s not the cleanest meal but 99% of it ends up in his mouth (if not then his hair). 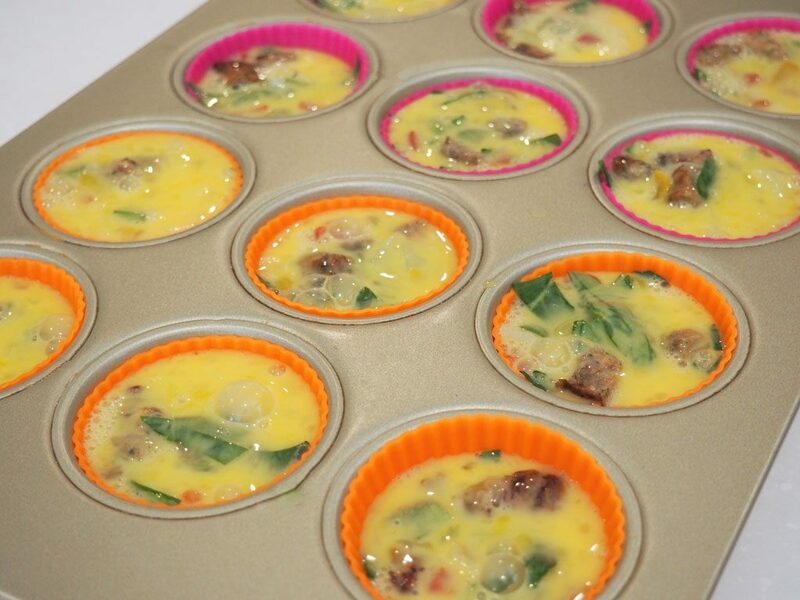 Option 2: Egg muffins: Recipe Alert! I make these every two weeks and they last great. Then cut up the peppers and onions and put those next. The amount really depends on you and your taste I also have used a few small pieces of chopped tomato. Pre-heat your oven to 350 and cook for 20 minutes or until done. You will know they are done when they start rising out of the liner a bit. Once they are cooled we wrap in parchment paper and freeze in a giant ziplock bag. Then when we make them for Liam we just put them on a plate and microwave for one minute. He gobbles them up! When we do these we put them on a plate with fruit and some kind of carb- crackers, half a piece of toast, etc. Other things we do for breakfast: Oatmeal with fruit, multigrain cheerios and almond milk, whole wheat waffles, banana/oatmeal pancakes. Lunch: I will share a look at Liam’s school lunch since he is in school 3 days a week and we mimic it at home most days. We use a bento style lunchbox as it’s what his school requires, and honestly it makes it so much easier for me. In the largest part I put his protein. He loves hard boiled egg whites so some days he has that or he has a sun-butter and jelly sandwich. At the top I put his “treats” so either pirates booty, pretzels, whole wheat bunnies, and a few earths best cookies. In the small middle spot I put blueberries. In the side I put cherry tomatoes sliced up, and either grapes or strawberries sliced up. At the bottom I put edamame and carrots(his favorites that he will always eat). These are his favorite foods that I know he will for sure eat. If we are at home I vary it some and he usually also has broccoli littles. Dinner: This is our trickiest part of the day. Liam is tired, we are tired, and he has decided that the thing he loved and begged for he hates now. So on this day Liam had grilled chicken, broccoli littles, seasoned mixed steamed veggies, and fruit. Sometimes if he eats well and asks he gets a cookie after dinner. He doesn’t always ask for one though. Other things we do for dinner are organic fish sticks or chicken nuggets, scrambled eggs, pasta, or ANYTHING with hummus. Liam loves hummus and there are nights here and there where the only way to get him to eat a vegetable is with hummus. Snacks: Snacks are pretty easy. Some of his favorites include fruit, edamame, tomatoes, Babybel cheese, multigrain cheerios, pirates booty, pretzels, cheddar bunnies and green smoothies. 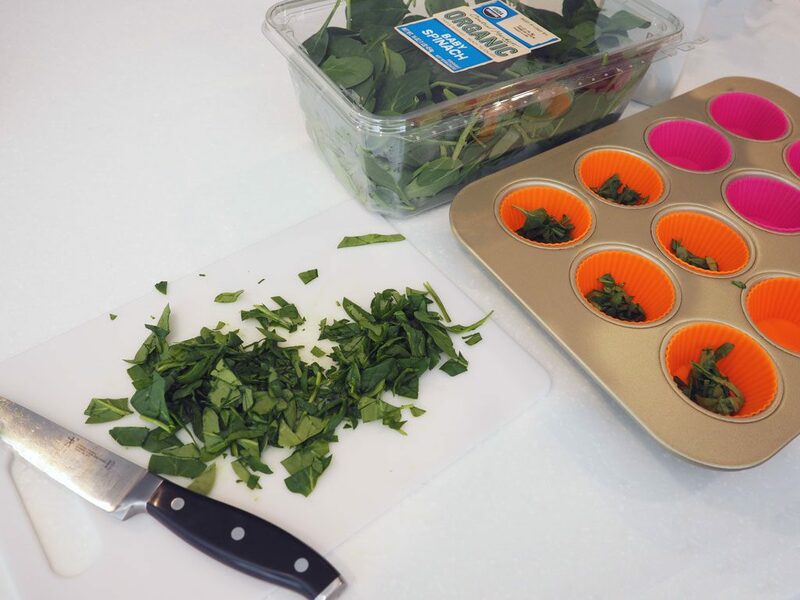 How we get veggies in him: This can be the hardest and like I said above we put them in the egg muffins with spinach and peppers. We sometimes will give him a pouch as a snack if he just really needs a veggie. We do broccoli and spinach littles which he loves and we do green smoothies. Liam also will surprise us a few times a week and just eat all his veggies like they are his favorite things in the world. Kids are just weird! Do you have any toddler meal ideas or tricks to get toddlers to eat? I would love if you shared them below! We love bento boxes for the boy’s lunches too. They make it so easy to give them a variety. I find my boys will eat more if they can dip it in something. For example they will eat carrots if they have a bit of ranch to dip. My sister in law has done the breakfast egg thing for years. Her kids love it. Getting people to eat can definitely be hard! I really needed this. My nephew is so difficult to feed and I think I can give my sister some of these tips. Even though my kids are older (8 and 10), this is still great info for me. My daughter would love those muffins! And I love that bento! I would eat those egg muffins myself! I love how easy they are to make. Yes, toddlers can be very fickle eaters. 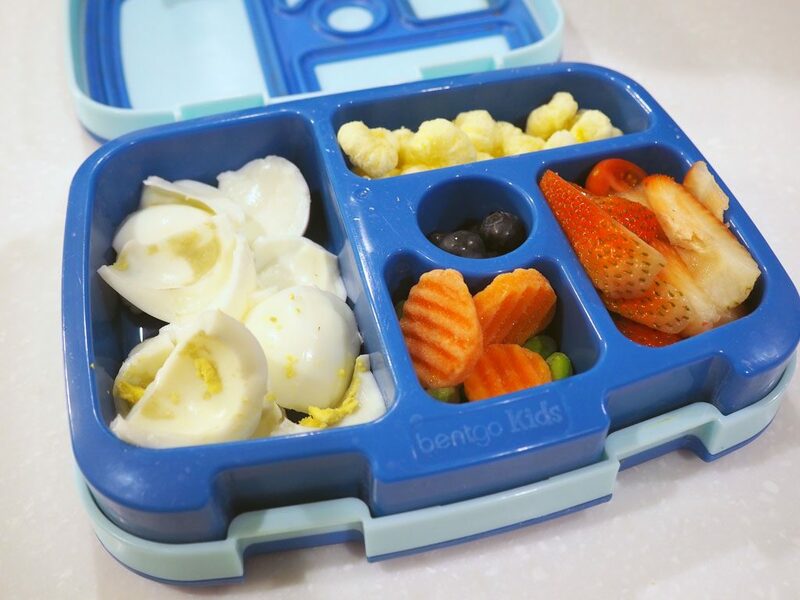 Wait a sec – his school REQUIRES bento-style boxes? Fascinating. Thought I had heard of every school lunch rule (our preschool had lots) but this is a first for me. Where we live, my girls are pretty much the only ones that use these, I think! I like your recipe idea. 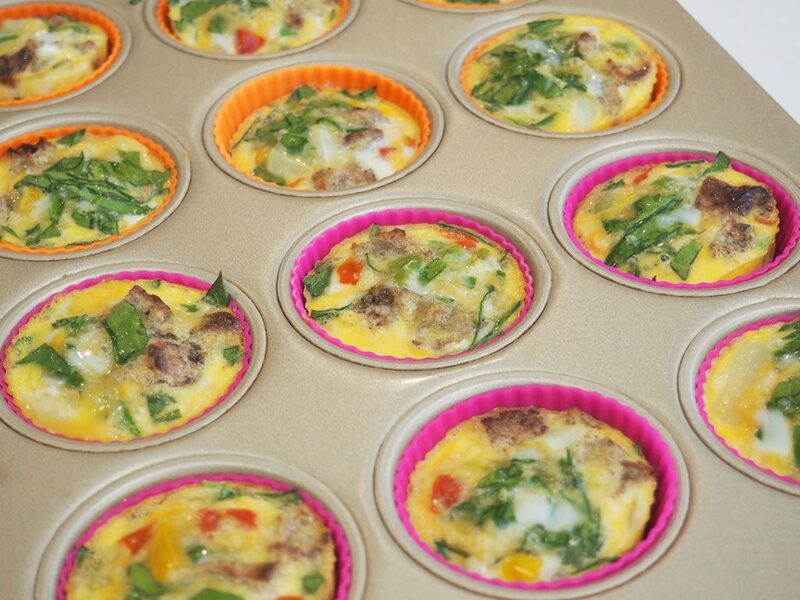 We are going to make these egg muffins for those days when I have my grandson with me. He eats some veggies, but hates broccoli. (“I no want to eat trees.”). Maybe if they are in these egg muffins, he would not mind. Awesome meal ideas! It can be difficult to feed toddlers, none of my children eat eggs when they were young! I have a toddler, too and he’s obsessed with hummus! He loves anything he can dip into, so we eat lots of yogurt, hummus, guacamole. I love that bento box. We need one! The muffins really do look like a kind of delicious variant on everything. They look like something I would even like it for breakfast. These all sound like wonderful meal ideas for toddlers, or picky children. I’d love to try some of these myself. 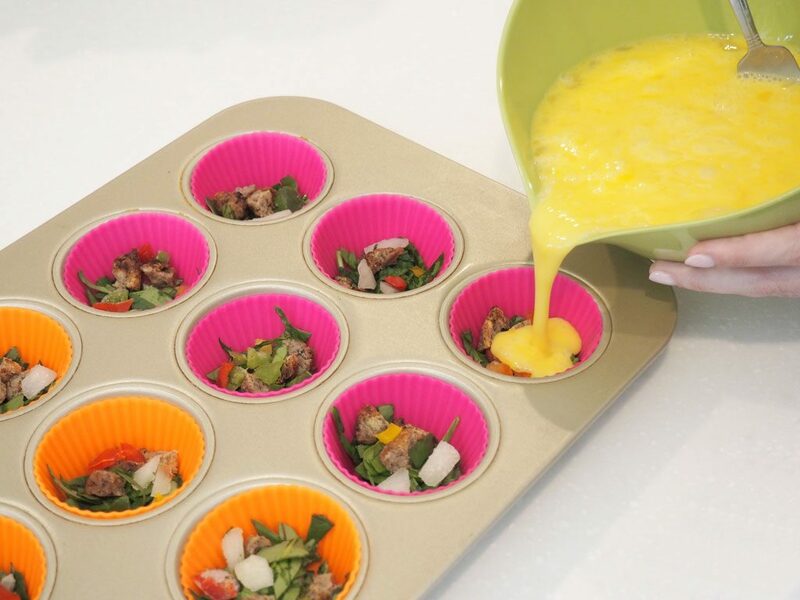 I will have to get some silicone muffin cups. These egg muffins look really tasty and I love that they are bite sized. Easy for a small child to hold and eat. I can totally relate and my personal experience has also been very challenging. Anyway, love the egg muffin idea. Thanks for sharing the recipe. Will try it out.